Lampada led dotata di sensore d'accensione che rileva la presenza della mano. Professionale e sicura, i tempi di asciugatura sono calcolabili in 5/60 secondi. Una potenza di 48W che garantisce alta qualità del prodotto. – Gel essiccante veloce sia sulle unghie che sulle unghie dei piedi. È la lampada per unghie tascabile perfetta per la scuola, l’ufficio. -72W alta potenza, asciugatura rapida -Può curare tutti i gel: gel LED, gel UV, Builder ecc. Lampada led dotata di sensore d'accensione che rileva la presenza della mano. Professionale e sicura, i tempi di asciugatura sono calcolabili in 10/60 secondi. Una potenza di 48W che garantisce alta qualità del prodotto. LAMPADA A LED UV CCFL 48W KT48 PER RICOSTRUZIONE UNGHIE TIMER NAILART FORNETTO!! 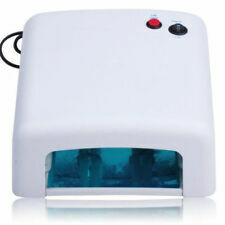 9W UV Gel Shellac Acrylic Curing Dryer Nail Machine. 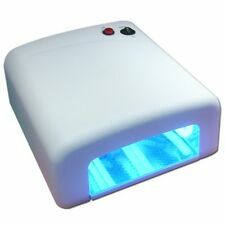 1x 9W UV Gel Shellac Acrylic Curing Dryer Nail Machine. Network Cables. Can be used for setting nail polish and various kinds of UV products, such as UV top coat / UV builder gel /etc. LAMPADA FORNETTO UV SUN4 SMART 2.0 36 LED 48W RICOSTRUZIONE UNGHIE MANI PIEDI NAIL PORTATILE SENSORE. Spediamo con i seguenti corrieri: GLS - DHL. RICOSTRUZIONE UNGHIE DA 9 W CADAUNO. 8 Bulbi professionali per lampada UV. Prima di ordinare, verificate la tipologia della vs. lampada UV. 1 Pair of UV Gloves. Machine wasable. Made With High Quality Soft to The Touch Material. Long Glove for Extra Coverage and Protection. One Size fit Most. Può asciugare quasi tutti i gel per unghie. 1x Lampada per unghie. SI ADATTA A TUTTA MANO O PIEDI. modalità a calore ridotto, per proteggere la pelle delle mani. Tipo: lampade a LED UV. Fit Gel Type: Gel UV / LED Gel / Builder / gel duro ecc. Avon Nail Experts Liquid Freeze Quick Dry Nail Spray // 2 x 50ml (RRP £12). "Spray nails dry in a flash. A convenient, fast-drying top coat in a easy to use spray. Features(48W) 1 x 48W Nail Lamp. And the detachable magnetic tray is more hygiene for toenails and easy to clean. Don't worry waste too much power. It is really efficiency. • Protect your hands, avoiding harm from outdated ultraviolet or UV light dryer. Lampada UV a led 48W per ricostruzione, colata o semipermanente unghie. 1x Lampada. Spediamo con i seguenti corrieri: GLS - DHL. 3、2-in-1 Dryer, Cool & Warm Air Nail Fan blower. 1 x Nail dryer. 4、Built-in FAN for Quick Nail Drying. 5、Switch to Select Cool or Warm Air. 6、with Sensor inside, this machine can feels your hands and the unit starts up and shutoff automatically. Automatic sensor - turns on automatically when you place your fingers in the lamp. Lamp flashes at 15 seconds and turns off automatically at 30 seconds. ★【AMAZING NAIL CURING LAMP】:Available for led gels, UV gels, hard Gels,nail builder gel, sculpture gel, gem glue and other gel use. 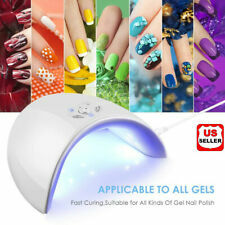 Great serviceability allow you to have different kinds of gels with your wish. Il tutto verra' visualizzato sull' apposito display con pulsanti e LED. Lampada UV ricostruzione unghie Autoriflettente. Caratteristiche tecniche. 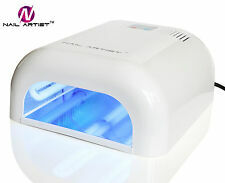 Mylee 36W UV Nail Curing Lamp. The Mylee 36W UV lamp will provide your nails with a professional, salon-worthy finish. The portable lamp features a sliding tray and removable base for comfort, versatility and ease of cleaning. ESSIE Gel Soak-Off Colors. Essie GEL - PROFESSIONAL TRIAL SET. List Price is for 2 gel bottles of. 42oz / 12.5ml. 1 x Base Coat. 1x Top Coat. Actual Images of the item are shown above. We promise we will work with you directly to resolve any issue you may have. 1x Feile schwarz gerade Körnung 100/180. 1x Feile weiss gerade Körnung 100/180. 1x Feile schwarz gebogen Körnung 100/180. 1x Pinsel Set bestehend aus 2x Gelpinsel, Fächerpinsel, Feinlinerpinsel, Spotswirl. Cosmopolitan On-The-Go Nail Lamp. Pop your finger in the nail lamp and the smart touch sensor will start curing gel polishes in just 30 seconds. Can be used cordless and corded. 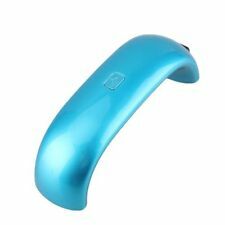 This On-The-Go nail lamp has one speed setting and uses smart touch sensor technology to cure nails in 30 seconds. 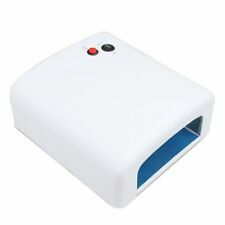 Novelty Red Portable Nail Dryer Stylish & Compact - Every Girls Must Have! Suitable for personal use, nail salon, college, nail art and travel. All products. All orders dispatched within 24 hours. Batteries not included-requires x 2 AA. Size 10 x 7 cms. NEW ARRIVALS. Very durable and dries wet nails quickley. Lampada professionale progettata con la nuova tecnologia a doppia sorgente luminosa con 24 LED da 72W. POTENZA: 72W. Inoltre, garantisce che la colorazione del gel per unghie non sia stravolta. Spediamo con i seguenti corrieri: GLS - DHL. The DreamWorks Trolls Lip Gloss and Make-Up Set for seriously scented makeovers! It contains scented lip gloss, eye shadow, make-up gels and easy-to-use applicators for the best makeovers ever. What's more, this makeup set is inspired by the smash-hit Trolls movie that fans will love. Kann bis zu 5 Jahre Dauereinsatz halten. 50.000 Stunden LED-Lebensdauer! Die UV-Nagellampen müssen nicht alle zwei Jahre wie bei älteren Leuchten ausgetauscht werden. Heilen Sie Ihre Nägel nach Ihren Wünschen! •This thin viscosity gel layers the Powder Polish to create a perfect structured nail. 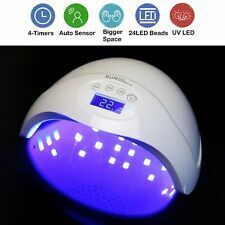 【 48W LED & UV DUAL LIGHT SOURCES 】 30 position optimized LED UV light beads with up to 50, 000 hours long lifespan, provides 48W powerful fast nail curing in both LED and UV for best curing results. I am selling a bundle of 5 x Pretty Quick Drying Spray. The bottles are all new and unused. I have taken some photographs for you to look through, these show the exact content and condition of the item and will hopefully help you to decide if this is the item for you. Thank you for your time and have a good day. KONAD Stamping Schablone Square Nr.5. Originale KONAD Schablone. mit dem Scraper über die Schablone ziehen. jetzt drücken und bewegen Sie den Stempel von links nach rechts / oder rechts nach links ( nicht wie ein Stempel direkt drauf drücken) über das gewünschte Motiv. Pretend Play Jewelry Kitt. Role play case consists of 19pcs accessories, including hair dryer, mirror, combs,etc. Your little girl can be a makeup designer, hair stylist, or nail artist all with this one play set. This Nail lamp can be operated using the mains adapter supplied and or the USB cable by connecting it to a computer, laptop or power bank. Super Portable. Advanced LED Technology.